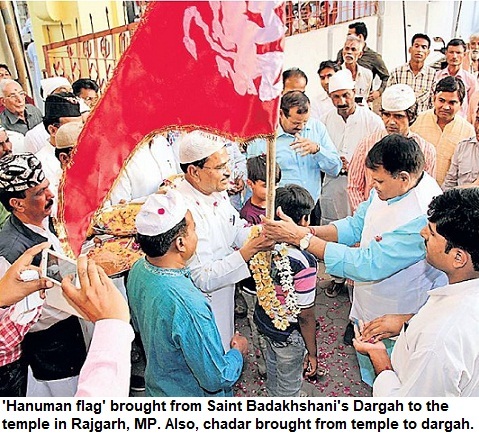 Indscribe's Blog: News and Views about Indian Muslims: Elections 2009: Will Majlis lose Hyderabad? For the first time in decades the hegemony of All India Majlis-e-Ittehadul Muslimeen (AIMIM) seems to be under a serious threat in Hyderabad. Zahid Ali Khan, the editor of the renowned Urdu daily Siasat, who has been involved with social work, is contesting the election as an independent candidate. He has managed to get the support of virutally every party on the political spectrum. The Majlis remains strong but this is the first election after the demise of veteran Sultan Salahuddin Owaisi and his son sitting MP Asaduddin may not find it a cakewalk as it was in the 2004 elections when his father had vacated the constituency for him and he managed to reach the Parliament. 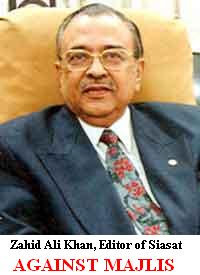 Zahid Ali Khan is seen a progressive leader. He has the right credentials and has managed a rainbow coalition with half-a-dozen parties supporting him. These parties have decided not to field any candidate in support of Khan. The Leftists, Chiranjeevi's Praja Rajyam, Telugu Desam Party (TDP), K Chandrashekhar Rao's TRS and several other parties have come out in Khan's support. Their aim is to finish Majlis' stronghold on Hyderabad. Though it is believed that despite the middle-class and educated class openly speaking in favour of Zahid Ali Khan and opposting the hooliganism by Majlis cadre, the masses may still vote for Majlis. Khan says that he is fighting a corrupt and communal party that has not brought any change to the lives of even ordinary Muslims for which it claims to speak. It was the attack on Khan that had led to widespread condemnation. It was suspected that Majlis cadre were involved in the incident. Subsequently, Khan became the rallying point of all anti-MIM parties. However, if the non-Muslim voters throw their weight behind the joint opposition candidate [Khan], Owaisi may have a tough time. Twice in the past, BJP candidates have managed to secure over 4 lakh votes and had once nearly given a shock to the late Salahuddin Owaisi. If these votes go to Khan apart from part of the Muslim vote, then Owaisi is in serious trouble. BJP is yet to decide whether to field any candidate from Hyderabad. It has been urged not to fileld any candidate to facilitate Khan's victory and in process end the Majlis' hegemony. The Majlis has in early years played a role in the politics of Hyderabad. After the police action, it was involved in social work and after Abdul Wahid Owaisi, his son Salahuddin who was termed Salar-e-Millat won Assembly election for over decades . Later Owaisi became invincible as fropm 1984 till 2004 he never lost the Parliamentary election. However, there is strong criticism of the family-centric party that revolves around Owaisis. The official party website mentions even Asaduddin and his brother Akbaruddin as Legends. The Owaisis had to start an Urdu paper Etemaad to hold sway on people and counter the other influential Urdu dailies--Munsif and Siasat along with Rahnuma-e-Deccan that had joined hands and were opposing Majlis' role. But MIM hopes that after the recent delimitation the rise is Muslim votes in the Hyderabad Lok Sabha constitutency, it has an edge even in wort case scenerio. The party had successfully faced a challenge from Amanullah Khan's Majlis Bachao Tehrik [MBT] in the past. It remains to be seen if the editor-turned-politician manages to stage a coup.